It is just as important to brush your baby’s teeth as it is to brush your teeth. Regularly brushing your baby’s teeth twice daily will ensure that their teeth remain healthy and will prevent any dental issues from occurring. Your baby’s first tooth can appear as early as six months of age and they will continue to have teeth erupt until they are about two years of age, however the exact rate at which their teeth erupt does vary amongst the individual. Once this first tooth arrives, you will need to be sure to start taking care of your baby’s teeth. Even before your baby has erupting teeth, you can start by taking care of their gums. To do this, simply moisten a soft washcloth or gauze square and gently wipe down their gums twice daily. It is recommended to also wash down their gums after feeding and right before you put them down for the night. Wiping their gums down regularly makes sure that all the bacteria is removed from their mouth, which is important once their teeth start to erupt. Once your baby has enough teeth to brush, you will need to pick out the proper supplies to take care of these teeth. You will need to find a toothbrush with soft bristles, a small head, and a large handle. When you first start brushing their teeth, you will want to use a very small amount of toothpaste. This amount should be no larger than a grain of rice. If your baby accidentally swallows the toothpaste, which will most likely happen at some point, this small amount of toothpaste will not cause any harm. Eventually once your baby is older, you can increase the amount of toothpaste you use to brush their teeth. Generally speaking, around the age of two you can teach them to spit the toothpaste out and at this time you will be able to increase the amount of toothpaste from a small grain of rice to a pea-sized amount. However, you should only increase the amount of toothpaste after your child has learned to spit and not swallow, as swallowing toothpaste consistently can cause their stomach to become upset. 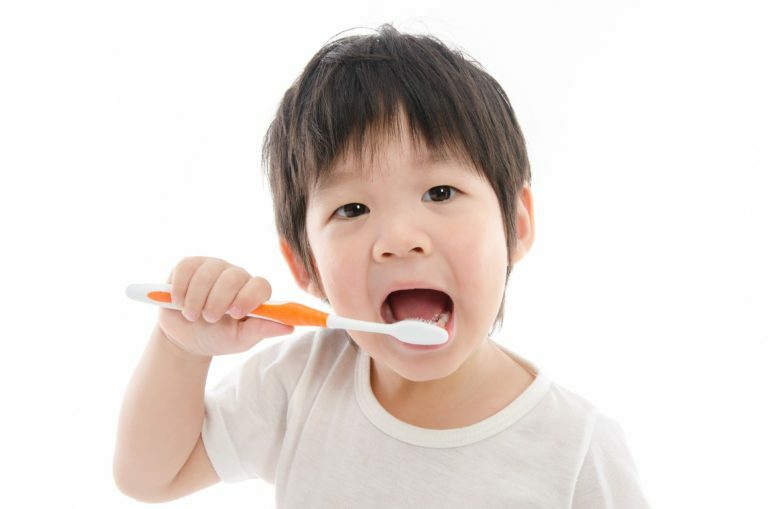 If your baby is reluctant or resistant to letting your brush their teeth, there are a few things you can do to make them feel more at ease. The first thing is to make sure you are being gentle while brushing. Remember, especially if they’re teething, their gums can be very sensitive and brushing too hard can be painful, which will cause then to resent the activity. If this is the case, you may want to use a soft washcloth until the sensitivity decreases. Sometimes a distraction can help as well. Try singing a favorite song or making silly faces. Anything that can keep your baby occupied while your brush their teeth is fair game. You can also let them play with the toothbrush to gain familiarity with it and make it less intimidating and more fun.